Smart wearables like smart watches, smart fitness trackers, smart TVs, locks, baby monitors, fans, thermostats are in trend these days. It’s a “smart everything” frenzy among companies in the electronics world where wall street is keeping close eye on Internet of Things (IoT) as the futures of smart healthcare and Internet of Things are intertwined, for instance, Mio Slice for personalized health monitoring and Aira smart glasses that help visually impaired people to see their surroundings. The smart healthcare area is growing at the rate of 25% annually from 2017 through 2025 and a sizable portion of the growth will be due to electronic health records as well as the use of big data solutions and analytics to make healthcare-related processes more nimble, efficient and accurate. Big-data analytics has also ushered the uptick in adoption of smart healthcare products, with the data gathered being used to understand patient behavior, as well as to monitor health conditions, specifically among the elderly population. Goldstein Research analyst forecast the smart healthcare products market size is set to reach USD 62.45 billion by 2025, at a CAGR of 12.1% over the forecast years. Rapid development and increasing purchasing power has resulted in propagation of smart phones coupled with 3G and 4G networks, which is anticipated to be a critical success factor for the growth of global mHealth market and subsequently smart healthcare product. The report covers the present ground scenario and the future growth prospects of the smart healthcare products market for 2017-2025 along with the data of shipments and adoption rate of smart healthcare products worldwide. We calculated the market size and revenue share on the basis of revenue generated from major players across the globe. The smart healthcare products market is forecasted on the basis of revenue analysis, product benchmarking and strategic developments of key market players. The report also includes micro and macro factors essential for the existing market players and new entrants along with detailed value chain analysis. Based on product type, electronic health record held the largest market share in global smart healthcare products market in 2017 as this segment is envisaged to substantially increase the market share in forecast period owing to favorable government policies such as American Recovery and Reinvestment Act (ARRA). Telemedicine and mHealth is the fastest growing segment and projected to increase at the rate of 15.3% over the forecast period. Smart pills are showing a humongous increase in demand and are likely to continue doing so till 2025, which are projected to increase at a promising CAGR of 7.89% from 2017 to 2025. On the basis of application, health data storage and exchange is expected to produce a revenue total of USD 37.5 billion by 2025 for the global smart healthcare products market. Global Smart Healthcare Products Market Outlook 2017-2025, has been prepared based on an in-depth market analysis from industry experts. The report covers the competitive landscape and current position of major players in the global Smart Healthcare Products market. The report also includes porter’s five force model, SWOT analysis, company profiling, business strategies of market players and their business models. Global Smart Healthcare Products market report also recognizes value chain analysis to understand the cost differentiation to provide competitive advantage to the existing and new entry players. 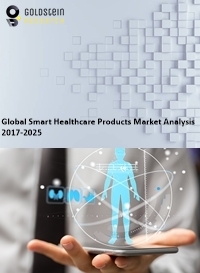 Our global smart healthcare products market report comprises of the following companies as the key players: Invacare Corporation; Abbott, AirStrip Technologies, Agfa-Gevaert, Alcatel-Lucent, Apple, AT&T, AthenaHealth, Epic Systems, Evolent Health, F. Hoffmann-La Roche, Google, Honeywell Life Care Solutions, HP Enterprises Services, Huawei Technologies, IBM, Johnson and Johnson, Medtronic, Microsoft, Misfit, Olympus, OMRON, Proteus Digital Health, Qualcomm, Samsung Electronics, STANLEY Healthcare Solutions, Voxiva, Warby Parker, WellDoc, and Zebra Technologies. Based on geography, North America demand for smart healthcare products expected to generate revenue of USD 22.56 billion by 2025 due to large number of incoming small and medium-sized enterprises, along with constant market consolidation efforts by the more prominent players. Epocrates, Medscape and MedCalc are used by doctors in US for being time-savers, speeding up the process of diagnosis, and limiting unnecessary doctor and hospital visits to cut down on taxing resources. Meanwhile, Asia Pacific is projected to show a robust CAGR of 12.56% from 2017 to 2025 owing to a quickly evolving healthcare industry on a digital scale. India launches world's biggest healthcare program, “Modicare” which is based on digitalized healthcare products like telemedicine and mHealth. Countries like India, China, Singapore, Indonesia, Luxemburg, Sweden, Malaysia, France and Russia are the opportunistic market owing to considerable number of live as well as pilot mobile health projects and mHealth launches in the European market are targeted at chronic disease management as well as monitoring activities of the elderly population.